Book Review: Aramis or the love for technology, Bruno Latour. The style of the book is very innovative. It takes the form of a detective’s novel, with two researchers trying to solve the mystery of “Who killed Aramis?” – or Was it killed in the first place?. However, this “novel” is not pure fiction, it is based on Latour’s own research on the Aramis project, though everything is presented in a dramatical (fictional) way that allows him the narrative freedom to expose his own theories about society and technology. 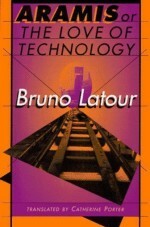 Specially, Latour uses the relation between the two researchers, a sociology professor and a young engineer, to articulate his own opinions on social sciences and the study of technology. Even though this way of presenting ideas can be attractive and appealing, it makes more difficult to criticize them, as they are all covered by rhetorical tropes. In this sense, it seems fairer to write about theory and research in a clear straightforward way, in order to facilitate and stimulate the further discussion of ideas. This way (the fictional) it looks like the author’s ideas are not open to discussion. However, the main features of Latour’s thought can be easily discovered behind this rhetorical style. His central idea of the non-human agents, the consideration of machines as “actants” in the network, is present throughout the book, using the most incredible rhetorical resources to convince the reader: references to Frankenstein as “something” independent created by human, fictional verbatims of what “Aramis” would think or say, imaginative descriptions of how the automated cars think, analogies between the independence of the apprentice and the independence of machines, etc. His thought is so embedded in the narrative that when the microprocessors enter the scene, he can’t refrain himself to introduce Leibniz’s monads – a key element in Actor-Network-Theory – that are the fundamental idea behind the concept of actants in ANT. It appears in a casual passage when the researchers are discussing the automatic functions of Aramis, so the metaphysical regression can be made without modesty1. The fragment refers to the possibility of programming the behavior of the automatic car, so it can function with autonomy, which makes it a “agent” (monad or actant) in the network, at the same level as a human, making an analogy between God creating humans and Humans creating machines. So, in his view we are created by God in the the same way we create automated machines: introducing all the possibilities in the software. Even if we overlook the direct reference to God as a literary license, the theoretical frame proposed assumes too much about what it means to be human. In this sense, the technological fantasies of Latour are the opposite of the typical science-fiction narratives: in the later Machines become aware of themselves and similar to “humans”, while in his description, it is the humans that become reduced to “machines” (or monads)2. The second relevant aspect in which the core of the author’s thought can be easily perceived is the way Sociology, and social science in general, is mocked and caricatured as a non-logical discipline, with unreliable methods of research and weak theoretical foundations. In contrast, the engineers mind is presented as stronger and better prepared to understand the complexities of technology. In other words, real sociology is an obstacle in Latour’s desire to mystify technology as an independent realm of existence, instead of an aspect of culture and society. The methodological implications of this sociology-fiction method of research are disastrous: the limits of a social research can only be defined by the research question. It is not a matter of establishing a limit wherever it conveys, but to establish it according to the theoretical frame that motivates the research. However, we have to admit that in this case the research question is so biased and poor (who killed a something that cannot be alive), that any theoretical frame proposed by the informants would highly useful. However, in non-fictional sociology, research has account of the social context and the social structure that surrounds the object of stufy, looking at the social background of an event is the key to do sociology. Society is the real object of study beneath any social research, and the particular aims of a research only can make sense in relation with that whole picture. The actors, subjects or informants usually cannot see this bigger picture, because they are directly engaged in it, and that is the perspective that social researchers has to add – that’s what the job is about. Nevertheless, informant reflections, narrative competence and interpretations are always highly meaningful. However, in this quote we discover the idea of “let the informants do the sociology for us” seems specially adequate when we are talking about technological studies, and the interviewees are mainly high qualified engineers. “Those who are constructing society” are the engineers creating the technology that shapes the world. Probably Latour or his characters would not dare to say the same when studying less educated populations. This attitude reflects a hidden elitism, that mixed with his rampant technophilia, helps him to project his technological fantasies. The picture drawn in this process is aesthetically akin to Ayn Rand’s idealization3 of the industrial entrepreneur, always driving the train of technological innovation. Aside from this illusory social science, from a sociological perspective the study of Aramis is relevant because it is the most successful of the Personal Rapid Transportations (PRT) systems that “interested everybody in the late sixties,” therefore it represents the social conflicts and tensions beneath this event. The study of PRTs could say something about how our societies fund and develop technological infrastructures. Case studies are used as a way to represent general phenomena and learn more about our societies, not (only) for the shake of knowing a particular fact (Who killed…). According to Latour’s methodology, the question of why PRTs were relevant at the time is not relevant because the actors do not discuss about it; however, from a sociological perspective that would be a central question. Fortunately, the book offers raw fragments of interview scripts and documents that help us do the work for him. So we know from a Canadian document (page 135) that the general interest in the PRT systems appears as a way to relocate the research investments of the tech-companies after the space programs slowed down. This piece of information seems to be very relevant to understand this issue. The main social repercussion of the PRTs would be the improvement of the conditions of transportation (and of life) for the public, it represented the socialization of the technological advances, giving a public car to the working classes (South Paris Suburbs), and making the expensive private cars less valuable. The tension between public and private, and the social class analysis of the project is obvious from a sociological perspective, but for Latour it is just “noise” that aparts us from the understanding of technology (Aramis). As if technology were a subject we could love or hate. In his argument the Frankenstein analogy is mandatory, although it is confusing because Frankenstein is not a machine (or a “technology”) but a man made through technology. Technology is just a projection of human creativity and social productivity, and not an independent reality or realm of existence (unless we mistify it). We only can love (a particular application of) technology for what it does or can do, or for the meanings embedded in it as a cultural artifact, or for the power or social status we can get through it. Technology is not a realm or a thing in itself, it is a feature of human culture. The lack of political interest in explicitly pursuing the research necessary for the development of Aramis, or any other PRT, is due to the particular signification of PRTs in the socio-economical and political context. 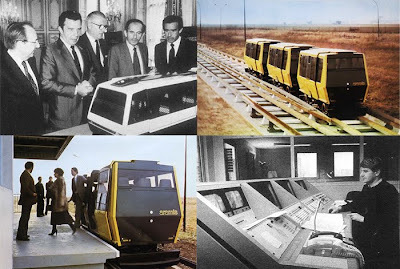 Love for Technology is abundant when it is about launching a rocket to the moon or developing sophisticated weaponry, but it lacks when it is about making a revolutionary improvement on public transportation. Why? Because the social structure (or “the network of social interests”, if you want) do not really support research in that area, although for some time it did: to relocate investments, for patriotism (French technology), etc. Technically, Latour does not offer us any real answer, but an abstract idealization and mystification of technology, which is misleading and apart us from the possibility of a sociological understanding of technology. To finish, the epilogue subtly addresses again the tension between public and private in transportation systems, when “the young engineer” reads an article and thinks that maybe Aramis (PRTs) could be developed backwards: instead of making a public transportation systems that offer the advantages of private cars, the private cars that will work autonomously as if they were a public transportation system. In other words, the self-driving private cars that are being developed nowadays do not present the social contradictions we found in Aramis, because they are born out from private interest and not a public investment in improving the general conditions of living. For this reason, there won’t be lack of “love” and money to develop them. This funny wink at the end of the book is very significant because addresses the real question beneath the case: Who is really interested in developing a particular technology -such as Aramis? Or more generally: What are human agencies and social interests behind the development of technological projects? 2In a philosophical or metaphysical discussion we would bring up Spinoza’s account of the Being (also known as God) and the subjects, to counterargument against Leibniz’s metaphysics… but in a sociological text we might stay out of metaphysics and stick to what is observable; namely, the Durkheimian account of what is a social fact. This entry was posted in Book Reviews, English, Texts and tagged Aramis, Bruno Latour, Critique, Love for Technology, Sociology, transportation. Bookmark the permalink. Post a comment or leave a trackback: Trackback URL.